The best thing about having married Ashley is, you know, being married to Ashley, cos he’s all cute and funny and stuff. Then there are other good things on top, like him being a superbly talented designer and illustrator, and making a cup of tea exactly the way I like it (brewed but not too strong, splash of semi-skimmed, absolutely no sugar or sweetener under any circumstances). An added bonus in our mixed up little family is that our daughter gets the benefit of two religious and cultural traditions that are basically steeped in food and family (and arguing). In the spring we get Seder and egg-smashing. In the winter we get candles, doughnuts and presents followed by carols, puddings and presents. For Ramona, it’s a win-win scenario, really, just on a fun and cultural level, but when she’s older she’ll also have a wealth of history and spirituality to plough through at her own pace. 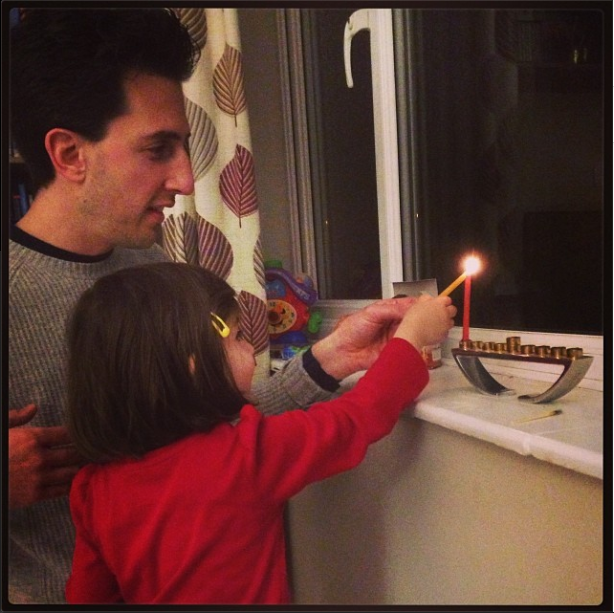 Anyway, here she is with Daddy, lighting the candles for the first night of Channukah, which came in on Wednesday. I might be biased, but it’s really quite adorable, no? Even the mess we’ve obviously shoved down to the end of the window sill. We haven’t broken out the doughnuts and latkes yet, but surely will soon (I mean, a holiday that practically requires the ingestion of fried stuff? I might be Greek Orthodox, but I’m not passing that up). In the meantime, I wish all those celebrating a happy Channukah, and a light-filled year ahead.